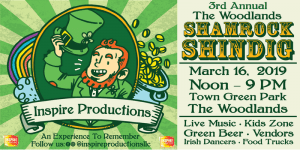 3rd Annual Woodlands Shamrock Shindig at Town Green Park on March 16, 2019. Browse the Event archive. Category: Spring - Woodlands. Tags: Community, Festivals, Food. Bookmark the permalink. Both comments and trackbacks are currently closed.